Once upon a time, off the coast of the Caribbean Sea, there is a man preparing his boat. He climbs in, adjusts himself on the seat, tucks his supply list into his pocket, and makes sure the bags he is bringing are safely stowed under him. He begins traveling to Tortuguero, the Costa Rican village where he plans to pick up supplies and sell some goods, but the weather suddenly turns and it begins to storm. He is afraid to keep going, fearing that he might capsize closer to shore if he continues on this journey. The sky turns black and the storm worsens; the man begins to lose hope, drifting in the Caribbean waters, alone and in the rain, unsure what to do. He decides his only hope is to turn back and return home without the supplies he desperately needs, so he begins to turn his boat around. Then, he sees an elegant green sea turtle swimming toward him, and he knows he will be able to get his supplies. The next day, after the man is home safely, everything on his list arrives at his door. In Costa Rican mythology, the turtle is a living symbol of patience, wisdom, and longevity. The end of the man and the sea turtle legend is this: when the turtle swims toward the man, the man can sense that the turtle is on his way to Tortuguero–the city of turtles–and so he attaches the supply list to the animal’s shell. As predicted, the turtle safely returns to its nesting grounds and faithfully delivers the supply list to the villagers. The next day, the villagers send the supplies over by following the turtle’s path across the sea. The turtle, this sacred, steady, and reliable animal, is the emblem and eternal source of hope at Hotel Poco a Poco, Monteverde’s premier eco-resort, in northwest Costa Rica. Even the name, Poco a Poco, little by little, suggests the steadiness and perseverance of the turtle, a metaphor that aptly describes the hotel’s constant–and careful–commitment to growth, sustainability, and ecotourism. 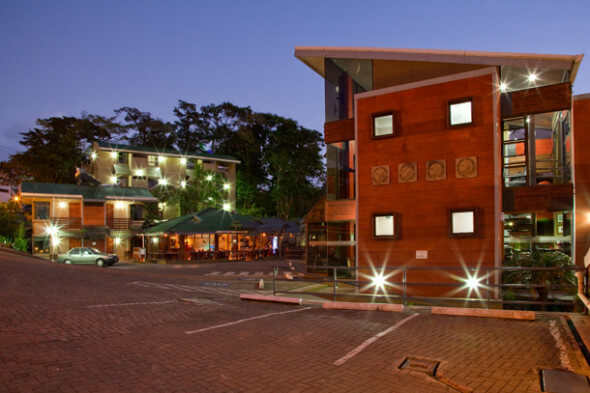 From five simple rooms to its now 30 rooms, a gourmet restaurant, full-treatment spa, heated pool, outdoor bar, walking trail, kid’s house, and brand new front desk building, Poco a Poco has matured into what I believe is arguably one of Monteverde’s best eco-lodges. Little by little, they have adapted and incorporated a number of fantastic sustainability initiatives into everything they do: not only did they recently receive the coveted 4-Leaf award given out by the Sustainable Tourism Certification program sponsored by the Costa Rican Tourism Board, but they consider environmental ethics in every aspect of their development and maintenance. They live by the motto that the world is inter-connected, vastly and preciously maintained through a delicate and web-life balance of health and wellbeing, and though visitors can’t actually see all these initiatives in action, they are all around them. Poco a Poco was the second stop we made with TAM Travel on our Costa Rica honeymoon. As soon as we arrived, Guiro, Poco a Poco’s new light-hearted and friendly manager, greeted us with a firm handshake and an invitation to walk around the property with him before dinner. Proud of the recent 4-Leaf award they received, he wanted to show off some of the incredible things Poco a Poco is doing to show its commitment to the environment, its guests, and its animals. I was thrilled to explore a little more of this hotel, nestled so perfectly in the misty cloud forests. Guiro took me around the lobby, downstairs to the outdoor pool and bar area, up toward the gazebo and walking gardens, down to the spa, and back to the reception, showing me everything–including all of the local plant species–along the way. 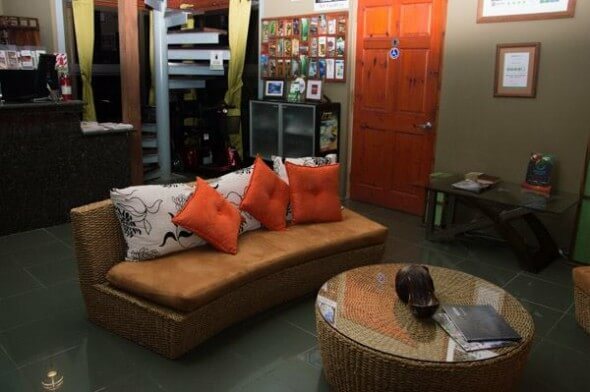 By the end of the tour, I was astonished: this 30-room lodge might just be the epitome of what real ecotourism aims to be: honest of the harmful realities that tourism can bring to an area’s ecosystem, but also aware and mindful of what it might do to counter those realities. For one, in 2005, Poco a Poco installed their very own water treatment plant, a plant that serves to filter, decontaminate, and help re-purpose used water in other areas of the property. Once the water is treated, a high-tech irrigation system filters the cleaned water throughout the property’s gardens, allowing for a safe and clean return to nature and providing sustenance and nutrients to the plants (75% of which, by the way, are native to Monteverde and bi-lingually labeled in Spanish and English). All of the cleaning products are biodegradable (including the trash bags) and pesticide-free, the spa and shower products are all-natural and put into dispensers in order to save unnecessary waste, and there are recycling containers for guests to use on all three floors. It was immediately obvious to me that this is the kind of place where guests can feel confident that the footprints they behind are just a little less permanent. Guiro smiled and made me promise that regardless of what else I write, I’d better write that in my article. So here I am: while it sounds cliche, Poco a Poco is luxury eco-lodge with a perfect price tag. At a little over $100 USD a night (a price that includes a full Costa Rican and international cuisine breakfast), I am confident that there is no better place to stay in Monteverde. I was absolutely sure of that after eating dinner a few hours later. The hotel’s restaurant, Otocuma, which means peace and tranquility in an indigenous local dialect and is adjacent to the lodge’s rooms, served the most perfect food we had during our entire trip. 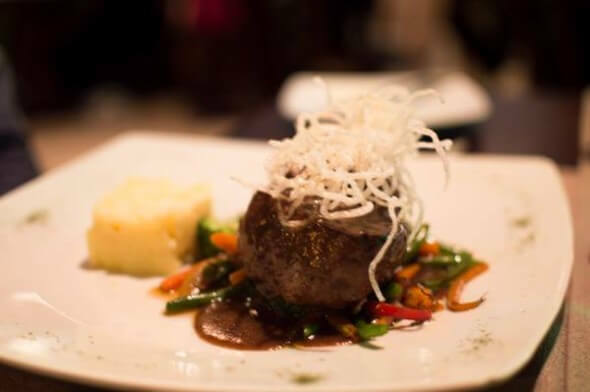 The sous chef likes to describe her cuisine as being decidedly Costa Rican with a fusion flair, an homage to the world’s decadent variety of spices, flavors, and ingredients. I ordered grilled tilapia with a papaya-infused sauce atop a bed of fresh vegetables and basmati rice. Ryan ordered the filet mignon drizzled with a coffee reduction sauce. (And, of course, we had the delectable tres leches cake for dessert–who could resist?). A live guitarist was playing in the corner lit by warm blue lights, and the restaurant was packed but not overwhelmingly crowded. 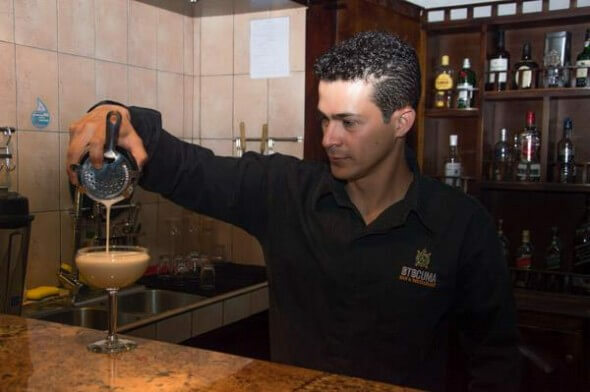 Otocuma features a local musician or music group every night of the week, ranging from classical to jazz to acoustic guitar, and is open nightly until 10:00 p.m. The appetizer dishes start at $6 USD and the entrees go up to around $24 USD. Poco a Poco’s rooms are elegant in their simplicity, too–a detail that really worked for me here. The entire aesthetic of the place is modern without being sterile, contemporary without feeling trendy. True to lodge-style, Poco a Poco features long rectangular windows, earthy colors in beige, brown, blue, and green, and natural hardwood accents. They are functional, tasteful, and extraordinarily cozy: with rooms ranging from doubles to triples to quadruples, they are all equipped with private bathrooms featuring eco-friendly bath products, soft bathrobes, and lighted wall mirrors, and each bedroom offers orthopedic queen and kind-sized beds with high-count cotton linens. Our room, which had an unobstructed view of some of the most colorful properties in nearby Santa Elena, was the perfect size for us: not too big, but big enough that we could open up our suitcases on the floor and still have room to walk around without tripping on everything. For two very messy travelers (at least I speak for myself here…. ), this was definitely a plus. There is also complimentary hi-speed Wi-Fi in all the rooms, which, as a working writer, is always a necessity for me. It’s also very, very quiet. Spending two days in Monteverde was a perfect middle between the jungles of Arenal Kioro, where we first stayed, and the West Coast beaches where we’d be heading next. Like Guiro said, we were right in the middle here–and I could think of no better place to be than here, with my husband, in this middle place, waking up early in the mornings, taking the short walk to Santa Elena, finding fresh tamales and hot coffee, and exploring the wondrous diversity of the cloud forests. The misty mornings, the sweet greenery, the deep green hillsides, the hanging bridges….as we left, I knew we would be back someday. Costa Ricans believe that sea turtles are born with deeply embedded internal maps in their bodies, maps that are formed and shaped by memorizing every single detail of the environment (from physical attributes like colors and textures to more intuitive ones like chemical compounds and magnetic fields). These maps, which are perceived to be much more sophisticated than any human’s mental map, help the turtles orient themselves no matter where they are, and always remind them–even deep in the ocean–how to get back home. 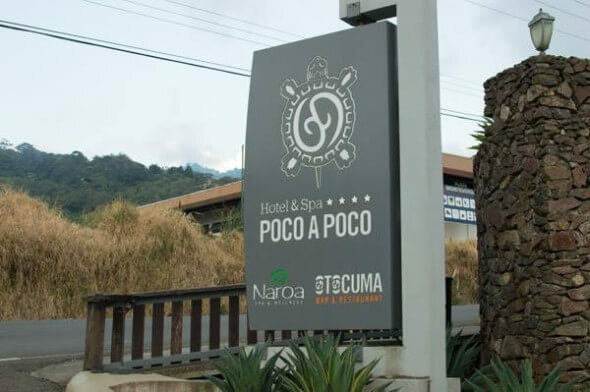 Luckily, Hotel Poco a Poco is here to remind us that even in the midst of adversity, there’s a bright light–and a turtle’s journey–that leads to Monteverde. Rates for the high season (December – April) range from a little over $100 USD to about $160 USD/night, depending on the size of the room. 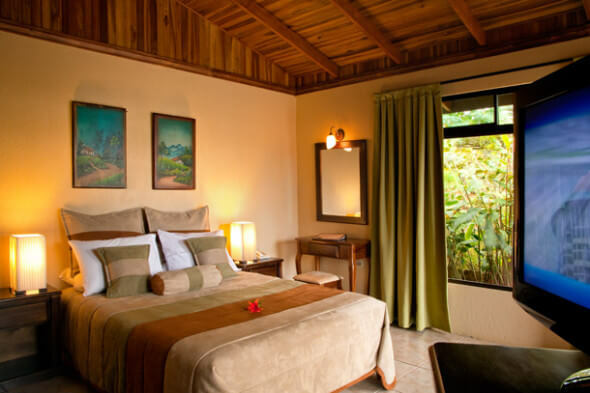 All rooms have a stunning view of the stunning cloud forests and the village of Santa Elena. 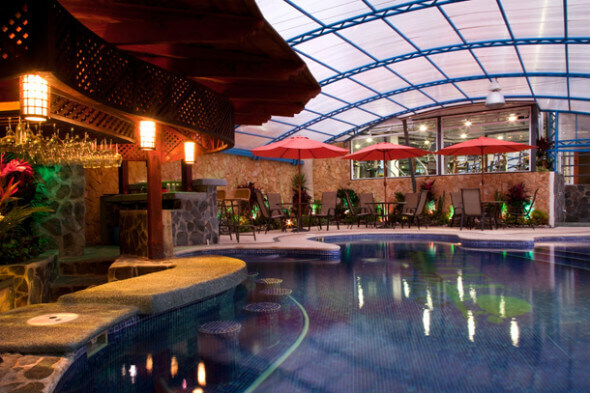 To book a trip to Monteverde and Hotel Poco a Poco, you can contact the amazing folks at TAM Travel Corporation to arrange everything for you (toll-free number from the U.S. is 1-877-826-8785) or you can book directly from the resort’s website. You can also book online through Priceline or agoda.com. Article and photographs (excluding front shot and bedroom shot, courtesy of Hotel Poco a Poco) by Kristin Winet. Simply put… my wife and I want to stay at this beautiful eco-resort. Your description of the restaurant and food had my mouth watering and the details of the room captured thoughts of a great nights rest after a full day’s activities. Like the intrepid turtle we hope too (visit/return) to this oasis some day.